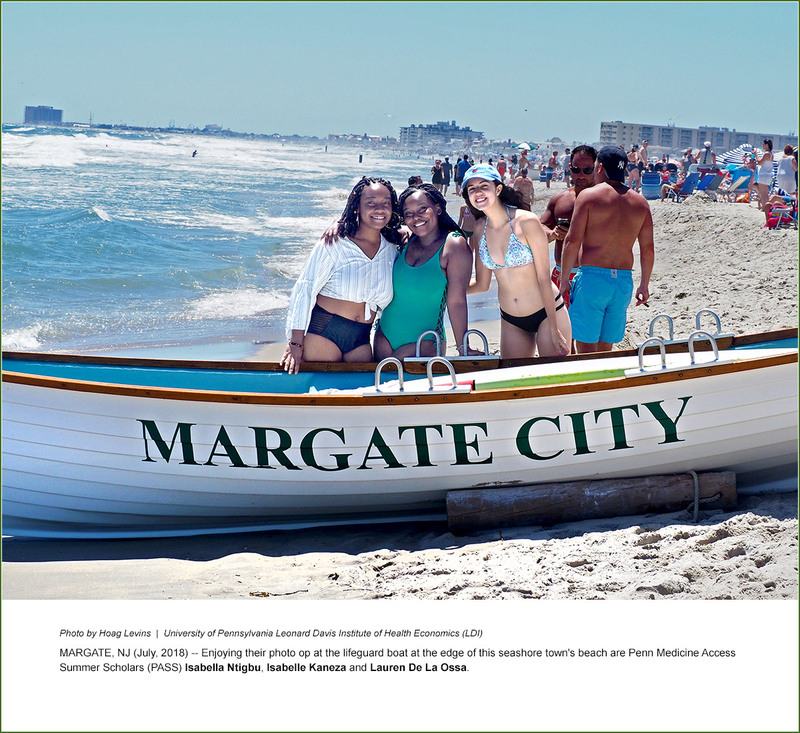 University of Pennsylvania Leonard Davis Institute of Health Economics (LDI) Summer Undergraduate Minority Research (SUMR) Program Scholar Mohamed Abdirisak of Indiana University takes in the salt air and nautical sights along the Inter-coastal Waterway that is also the back bay at Margate, New Jersey. Abdirisak was one of 30 Penn-related students who were hosted for a day at the dockside home of Wharton School Professor Emeritus of Legal Studies and Health Care Management, Arnold (Skip) Rosoff, JD. The annual event of the Penn LDI SUMR program was expanded this year to include scholars from the Wharton School's Summer Program for Undergraduate Research Scholars (SPUR), and the Penn Medicine Penn Access Scholars (PASS) Program. This last is a mentoring program for pre-med students underrepresented in medicine. The Rosoff summer home features a patio wharf and a broad view of one of the area's most trafficked boating channels as well as a major fishing site. Above, left, the arriving scholars have their lunch and chat as they get to know each other better. Above, right, the house's patio and balcony look across the water toward Pork Island Wildlife Area, a protected salt marsh teeming with birds. Above, left, on the patio are SUMR Scholars Amanda Carrillo-Perez and Zara Wermers, SPUR Scholar Sydney Bell, and SUMR Scholar Mohamed Abdirisak, Penn Research Assistant Sophia Kim, SUMR Scholars Tania Calle, Nahnsan Guseh, Alec Hilton, Tolu Omole and William Jackson. Above, right, the height of Rosoff's recently renovated dock is designed to accommodate the rise and fall of the daily tides as well as the projected continuing rise in ocean levels due to global warming. Some of the visiting scholars try swimming directly off the dock in surprisingly clear waters (above, left). Mounting up on Rosoff's fleet of bicycles (above, right) are (l to r) LDI SUMR Scholars Alec Hilton, Amanda Carrillo-Perez, William Jackson, and Tolu Omole who are off for a ride along the bay road toward the southern tip of the island on a beautifully sunny day. Arnold (Skip) Rosoff (above, left) has been at Penn's Wharton School for 48 years, is one of the longest tenured LDI Senior Fellows, and has been a mentor to SUMR scholars for 19 years. 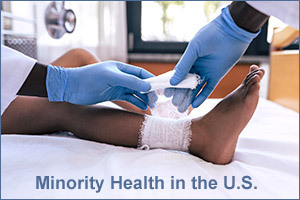 "Diversity pipeline programs like SUMR are essential if the U.S. is to have a properly representative healthcare system," said Rosoff. "I'm proud to have been a mentor in the SUMR program from its inception and it's just great fun to interact with these students. They're so bright, talented, motivated, and interesting. The annual SUMR day at the shore is a blast… for all of us!" Rosoff is one of more than four dozen Penn faculty members who serve as mentors and provide other supports to the SUMR program. Above, right, Rosoff inflates the tires of some of the bikes his visitors will be riding. A literal high point (they climb into the observation howdah 60 feet above the ground) of the annual SUMR Margate outing is a visit to Lucy the Elephant. Built of tin-sheathed wood 137 years ago as a Victorian Age real estate marketing gimmick, the elephant building is one of New Jersey's most beloved shore landmarks. Above, left, a portion of the Penn cohort gather for a group photo in front of Lucy: [Standing] LDI SUMR Program coordinator Safa Browne, Mike Greene, PASS Scholars Matthew Barrett, Donald Detchou and Jared Shulkin, SUMR Scholar Mohamed Abdisirak, SUMR Program Director Joanne Levy, SUMR Scholars Alec Hilton, William Jackson, Amanda Carrillo-Perez and Tolu Omole. [Kneeling]PASS Scholar Isabella Ntigbu, SPUR Scholar Lisa Yang, PASS Scholars Cecila Zhou, Lauren De La Ossa and Isabelle Kaneza, SPUR Scholar Sydney Bell and PASS Scholar Sheldon Amoo-Mitchual. Above, right, Lucy looks over the roof of the Lucy Burger Shack and past the Margate Beach Patrol Building at the path that goes across the dunes to the beach. This view from atop Lucy (above, left) shows the crowded white sandy beach in front of her that is rated one of the state's best beaches. Climbing the spiral stairwell built into Lucy's leg, the Penn contingent and other tourists entered the elephantine body cavity (Above, right) that is appropriately painted peptic pink. The space is a museum featuring exhibits about the elephant building's colorful history. From inside the elephant's massive head, (above, left) PASS scholar Lauren De La Ossa looks out the circular window that is one of Lucy's eyes (above, right). The elephant structure is topped by a howdah (above, left), or traditional Victorian-era Indian elephant carriage. Standing six stories above the ground, the surprisingly large structure provides a spectacular view of the beach and ocean below. Enjoying that view are (above, right) [standing] Mike Greene, PASS Scholars Matthew Barrett and Cecilia Zhou, SUMR Scholar Mohamed Abdirisak, PASS Scholars Donald Detchou, Isabella Ntigbu and Jared Shulkin. [Kneeling] LDI SUMR Program Coordinator Safa Browne, PASS Scholars Isagelle Kaneza, Sheldon Amoo-Mitchual, and Lauren De La Ossa. Exiting Lucy to spend the rest of the afternoon on the beach are (above, left) PASS Scholars Isabella Ntigbu, Isabelle Kaneza, and Lauren De La Ossa. Above, right, PASS Scholars Isabelle Kaneza, Cecilia Zhou and Sheldon Amoo-Mitchual, and SUMR Scholar Mohamed Abdirisak. As the sun set over the marshes on the western horizon, the Penn cohort returned to the house to enjoy the view like SUMR Scholars (above, left) Nahnsan Guseh and Risha Sheni. Above, right out on the dock, are SPUR Scholar Sydney Bell, and SUMR Scholars Tolu Omole, Tania Calle, Zara Wermers, and Ayomide Ojebuoboh. Hungry scholars close in to watch as SUMR Program Director Joanne Levy, MBA, MCP (above, left), gets the burgers and dogs underway on the grill. The early evening boat rides begin soon after dinner. Above, right, Captain Rosoff prepares to cast off with the first round of passengers, Wharton Associate Professor of health Care Management Claudio Lucarelli, PhD, and his family (l to r): wife Monica and children Gabriella (12), Elena (7), Costanza (14) and Roberto (10).